Over the holidays, it's easy to overlook some of the highly perishable foods in the refrigerator. There are so many goodies, coming and going, that some ordinary foods, that would normally get gobbled up, are pushed to the back, to spoil before use. Before that happens (or before it happens too greatly), I begin some refrigerator triage. First, I use anything made with meat, or that has touched meat, in the cooking. This past week, that meant some marinara sauce which had meatballs cooked in it, and some bbq sauce which had cocktail sausages cooked in it. I combined those two sauce remnants, to use a sauce on a homemade pizza. Next, I use any soon-to-expire dairy products. This meant milk, whipping cream and sour cream in our house, this past week. I pushed the milk on anyone who would drink some. In the process, we started a new tradition in our home. After the late church service on Christmas Eve, we all joined in the living room for some hot cocoa. It was a very pleasant late night, together. I believe that this will continue forward, as a tradition in our family. And I used the last of the sour cream in a dip on Christmas night. I already mentioned whipping up the last pint of heavy cream, to freeze in mounds for future desserts. After the meat and dairy, I inventory, and make plans to use, all of the fresh produce. I found 2 acorn squash, 1 butternut, 1 spaghetti squash and 1 small pumpkin, all needing to be used. I cooked the 2 acorn squash, first, as they looked to be on their last legs. 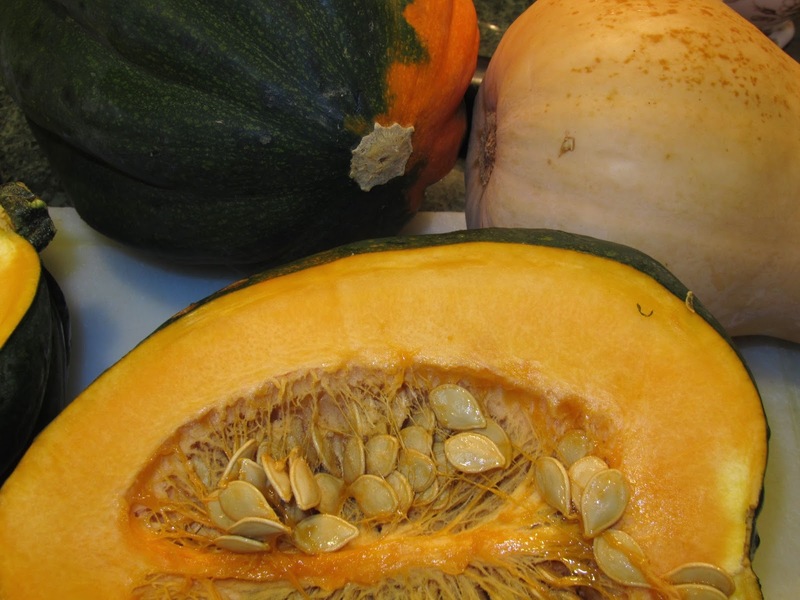 The other 3 squash will be cooked within the next 10-14 days. I also have about 15 pounds of aging potatoes to use in a hurry. It looks like the next few meals will be heavy on the squash and potatoes. I also had 3/4 of a lemon and a handful of fresh rosemary that was gifted to us earlier in the month. 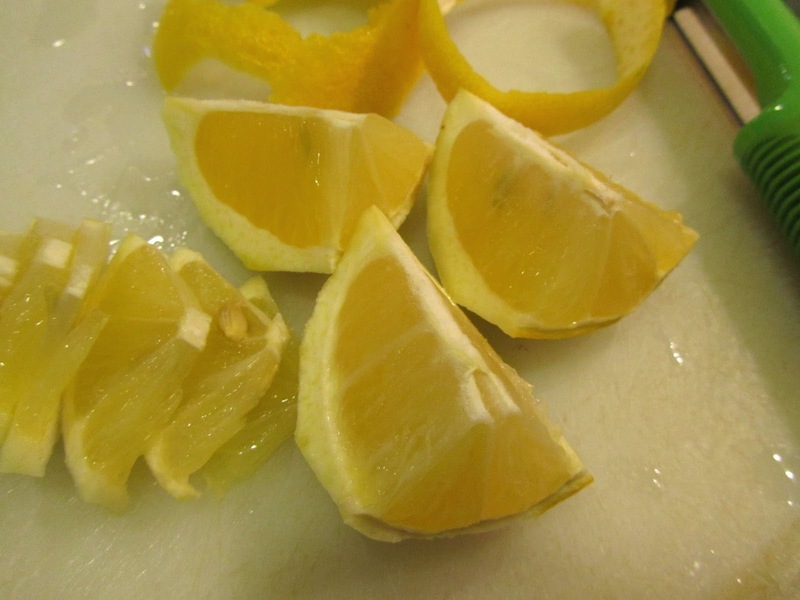 I peeled the lemon, and sliced and quartered the rest of the lemon. 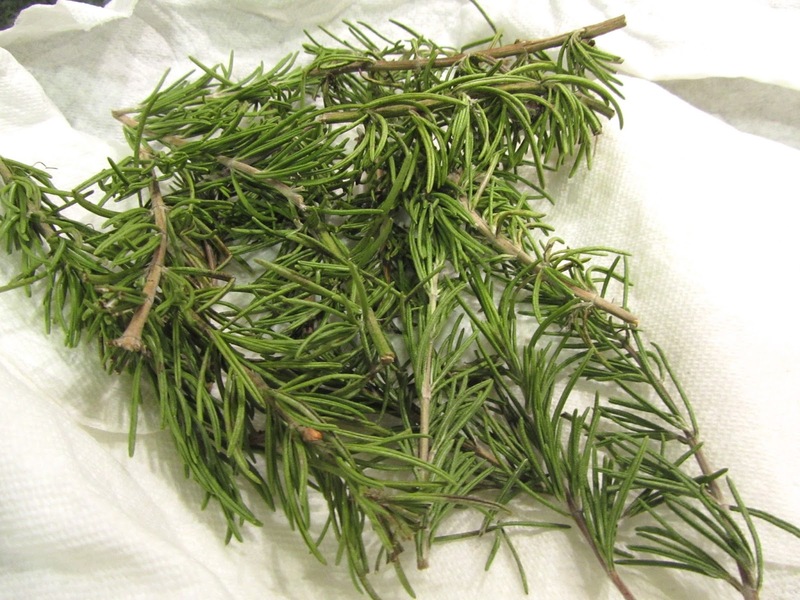 The lemon zest will be combined with the rosemary to make some of the Lemon-Rosemary Finishing Salt in this link. The quartered slices went into the freezer, for sage-honey-lemon tea that I drink when I have a cold. In addition, I have a glassful of fresh parsley in the refrigerator. Just before the very cold weather set in, in early December, I cut all of the remaining parsley in the garden. I put it in a glass of water and kept it in the fridge. Several weeks later, it still looks okay. I will use as much as I can in the next day or two. And, I found about a dozen very wrinkly apples, in the garage fridge. I had wanted to make a pie with some of them. Sometimes, though, there's just no time for what we want, and we have to go with what is easy. So, I made a quart of applesauce, instead. That leaves us with fresh carrots, celery, onions, cabbage, oranges, tangerines and not-quite-aging potatoes in the refrigerator to use over the coming month. That's about it on the highly perishable items left in our fridge. I had about 1 cup of rice pudding that went too long in the fridge and had to be thrown out. But otherwise, it looks like a very low-waste holiday period. Great job on all of your food saves. Food triages should be something that we all work into our holiday schedule. Not only would we lessen our food waste, we might eat a little better as we replace some of the baked goods with other more "regular" food. Yes, good point, live and learn! My tummy felt better having a produce heavy meal last night, in place of other rich holiday foods. Kudos on not wasting anything. I'm of that same mindset. I was in the garage and saw the last two remaining butternut squash last night. I was afraid that they might have been sitting too long since we have had a lot a freezing but I cut them open and they were still fine so I roasted those and they are so sweet! Yum. I chose not to make tacos last night since we still had a lot of leftovers that needed to be eaten first. My girls worked a funeral yesterday and came home with a lot of ham buns and cake so there is even more leftovers. I think tonight the choice of leftovers will be gone so it will be tacos tonight. We thankfully didn't have a lot of anything else in the fridge that needs to be used except for milk. No one is drinking it and I think there is about 1/3 gallon left. I saw some ham but everyone nibbles on that so I'm not worried about it yet. I guess I could say we had zero waste and that's wonderful. Good save on the butternut squash. And I bet it was delicious! We've gotten off our usual routines, here, and the milk isn't being drunk, as much, either. I'm having to think of ways to "entice" its consumption. Good luck with yours. Good job on organizing and saving the food! We have been working hard to use up leftovers the last few days. There was vegetable pizza and cheese ball left from our snack-y meal on Christmas Eve night, and ham left from Christmas dinner, although I sent some ham home with my oldest son, and also some home with his girlfriend. I ate the last 1 1/2 pieces of the vegetable pizza for breakfast yesterday morning, and took cheese ball and crackers to work for lunch. My 14 year old son is still out of school for break, and yesterday he ate ham sandwiches, and finished the last of the cheese ball. I was planning on a chicken and rice casserole last night, but when my husband got home from work he suggested we just finish the ham. I wasn't super excited about it, but agreed. My husband fried ham, and eggs, and made toast. I made myself two grilled ham and cheese sandwiches. My youngest son ate more cold ham sandwiches...he loves ham sandwiches, and never seems to tire of them. I am very happy we were able to use up all of those leftovers! I must say I'm feeling a bit tired of all of the holiday foods for the time being. We had a lot of Christmas cookies also, some baked at our house, and a plate of a variety of Christmas cookies from my sister. My husband, and I have been nibbling on those, but my youngest son has been hitting those really hard (growing teenager...Lol). I noticed this morning that the goodies should be gone soon. That leaves 1 1/2 half gallons of eggnog dated 12/26, and 1 half gallon dated 1/5. My son and I have been working on 1 gallon, and I think we'll get that finished. The other half gallon dated for 12/26, I think I'll pour a bit out and then freeze. The half gallon dated 1/5 I'm hoping will be drank when my oldest son and his girlfriend come over on New Year's Eve. I noticed we had 3 small clementines left in the fruit bowl on the bar this morning. They were getting a bit soft. I brought them to work with me, and peeled them this morning. They were still fine, so I ate those for breakfast. There is 1/2 a bag of baby carrots in my fridge leftover from the veggies/dip on Christmas Eve. I also noticed a few potatoes in my mud room that need to be used soon. I'm thinking some potato soup with carrots in it will be on the menu later this week. Tonight, we get to have normal, non-holiday food for supper! Yay! There was one tangerine in the bag I bought that looked like it was too soft, and wouldn't be any good. But I was wrong. It was perfectly fine, inside. Also, I have a spot n the garage fridge which sometimes freezes produce. An orange was up against that spot, and half of the orange seemed to be frozen. I let it thaw, and it peeled fine, and was still good inside. So, I guess citrus can take a little but of a beating and still be okay. If you feel like doing any baking this weekend, here's a recipe for eggnog scones, to use up some of that eggnog. I copied this off of a carton of eggnog 20 years ago. You can freeze some of the dough (rolled out and scored), before baking, and bake part of them on another day. Also, you can use eggnog in waffles and pancakes, for the milk. The potato-carrot soup sounds like it will be very welcome. Have a great day, Angie! Yes, you're right. I guess it's a matter of freeze what you can right now, and use the rest, quick. I am tiring of holiday foods, and we still have 3 more holiday meals/events this week. One of the meals, I'm the cook, so I can control what's available. The other two, I'll be picking an choosing very carefully, and trying to eat "normal" foods. I hope today is a special one for you! have a lovely day, Sara! I rarely would say this, but right now applesauce sounds better to me than apple pie--I'm starting to get tired of all the high-calorie goodies and am craving simple and healthy. Good save on your apples! Your advice on freezing cream cheese reminded me that I had purchased a few extra boxes on sale that I wasn't going to get through before the expiration date, so now they are living in the freezer! :) It's not a good deal if it grows green fuzz in the fridge. Ha. I think my stomach agrees with you. The applesauce was very welcome. I find that when we go on vacation, towards the end of a trip, I begin thinking of humble foods and how much I miss them. Only so much holiday food I can eat these days. Good job on getting the cream cheese into the freezer. No, not a deal at all if it all goes to waste! That reminds me, I've got a lot of cream cheese to use up, still, or do something with. Have a great day, Kris! I hope you and your kids are enjoying the wintry days! Good luck with your cooking ahead. Have a nice visit with family. I feel that way about January. It's traditionally been my month to read a lot, as the garden can't be worked in, and we're in a lull between holidays and birthdays. Good luck with your work, Melissa! I hope your day is very productive. I went through my fridge after your post - thank you for the suggestions. I froze the cranberry sauce and put it in orange juice today and it was yummy. I also had half a jar of applesauce that had been in the fridge for awhile so I froze that in 1/2 c. portions for applesauce cake. I have several winter squash sitting on my counter and I know I need to use them up. My husband isn't fond of squash. I like it but not love it. What is the best way to utilize them? I have roasted them, but wondered what else to do with them. Any suggestions? Good luck with dealing with the squash.